Gabriel Tall Chief and Horace Brave Scout welcome you as an honest friend and candidate for Retrostar challenger! 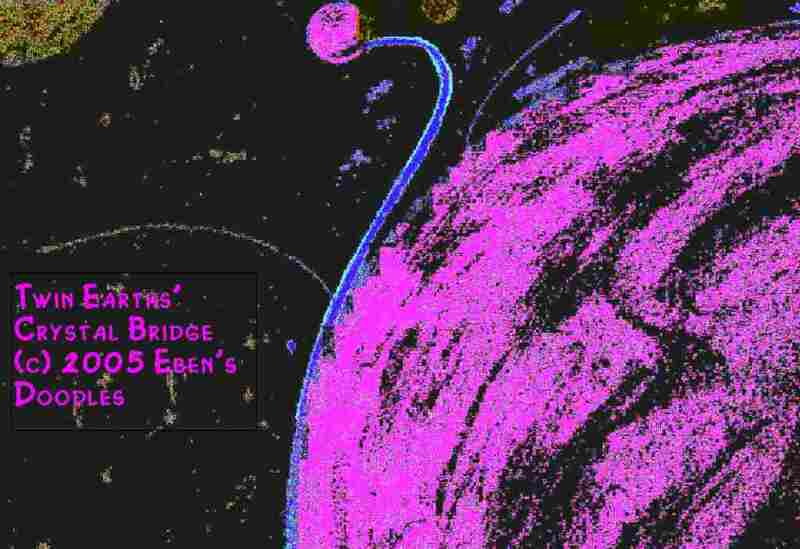 This is a narrative by CP-challenged Gabriel and his cousin Horace that chronicles, the struggles of humanity enlisted in a genius's computerized zero sum wargame against the global invasions of unknown superior entities. 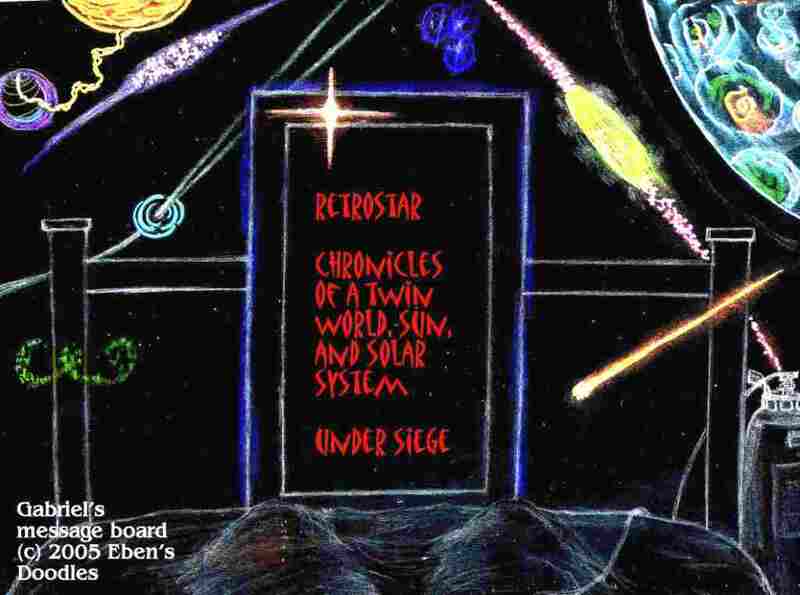 The Twin Earth chronicles record these battles with relentless waves of alien power which cause the reversal of technology and culture. Mankind sustains one attack only to be blasted by another. How many onslaughts will come? How will they appear? How long can people cope? Or can they? In today's society that has come to question the ability of world powers and leaders to solve catastrophic problems, the struggles of people on Earths I and II will speak to all those who are searching for a winning strategy in a seemingly no-win dilemma. 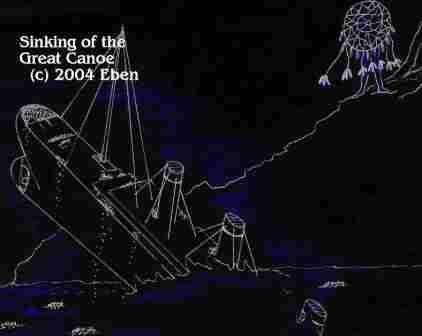 One of the world's richest men, John Jacob Astor, found the science fiction he wrote could not equal the reality of what happened to the world's greatest ship and also to himself. Please return, for this will soon be on-line. 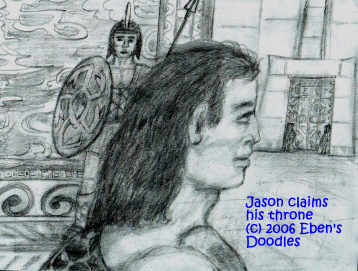 CHRONICLE OF JASON'S QUEST FOR THE GOLDEN FLEECE IP A. 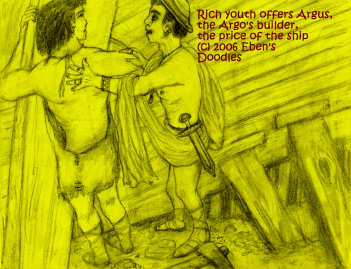 A. S. 1200, Voyage of the Argonauts How the Atlanteans, working behind the petty geopolitics of humanity, sought to stop Jason of Iolkos from gaining the Golden Fleece and returning a hero to Greece. All it needed was such a man to unify the whole country of Achaea (at present a hodge-podge of rival city-states and kingdoms), which would then be a major setback to the expansion of Ilios and its snake goddess, which the Atlanteans had chosen to pump as a major piece in their strategy to regain Earth II. "Subfile A4: Christmas with James Dean, A Requiem with Pointsettias" 61000202A-Z, Subfile A5, "A Fawn in Winter" 61000202A-Z, Subfile A6, "A Fulani Christmas"
Way back in time, before Earth II was relocated to a safer part of the Universe (though no place was really safe from the Red Dog Star) and people like Joseph II existed, Horace Brave Scout, Bearer of the Twin Feathers, was still taking his spirit-journey throughout the West and Southwest. Where did he get the feathers that actually guided him, without his knowing, on his long journey of discovery and renewal? They had belonged to his grandfather, who was found lying frozen stiff on the floor of his unheated cabin. 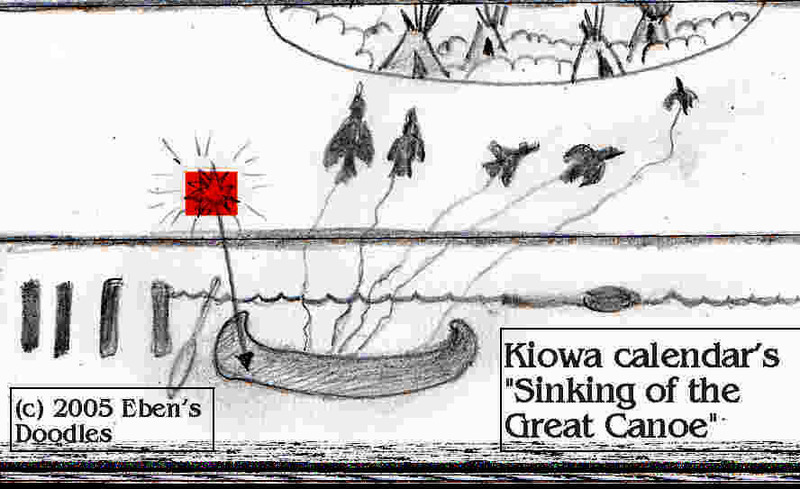 Horace Brave Scout was rounded up with other relatives, and they did the best they could for the old man, who had lost his wife years before to broken heart, a common ailment on the reservation. What few things were worth saving were taken away by family members. 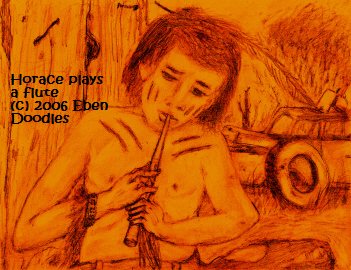 Horace too found something to remember his grandfather by--a sacred hoop lay broken on the floor amidst some wood shavings (his grandfather was working on a peace pipe when he died). 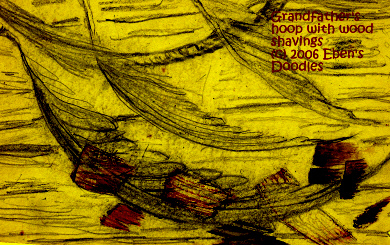 The hoop--it was no good--but the feathers, two at least, were good for taking. This is the way Horace came to wear the Twin Earth Feathers, which became his heraldic escrutcheon or signature or coat of arms. In western South Dakota, near his own homeland of the Lakota on the Pine Ridge and Rosebud reservations, Horace paid a visit to Spearfish, which lay on the edge of mountains sacred to the Lakota, the Black Hills. He happened to walk in one night just after everyone had left the play set and amphitheater used to stage the annual Black Hills Passion Play. As he walks down the street in front of the Jewish Temple, the Palace of Herod, and the Roman courthouse where Jesus is tried for insurrrection against Rome--an image flashes in upon his mind. He would have left town except for it, but it is so vivid he decides to stay and see if he can find work as an extra for the cast or maybe even as help for the stage crew. 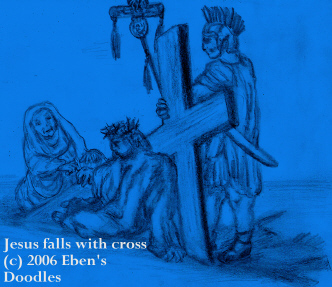 He applies the next day, and lands the job of stand-in for none other than Simon the Cyrenian, just passing by in Jerusalem on the eve of Passover when the Roman guards grab him to carry the cross after the flogged, half-dead, blood-covered, beaten-almost-face-less Jesus stumbles and can go no further with it. More amazing still was his actually playing the part, when the actor for Simon calls in sick. 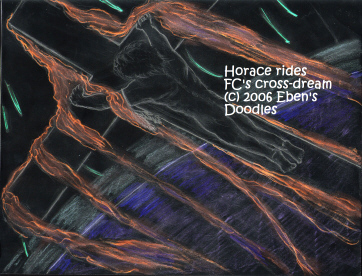 The cross looked much heavier than it was, but yet it proved heavy in another, unexpected way, as Horace shouldered it down the street to the Hill of the Skull, the crucifixion site. Somehow, nobody who touches something like that is ever the same again. 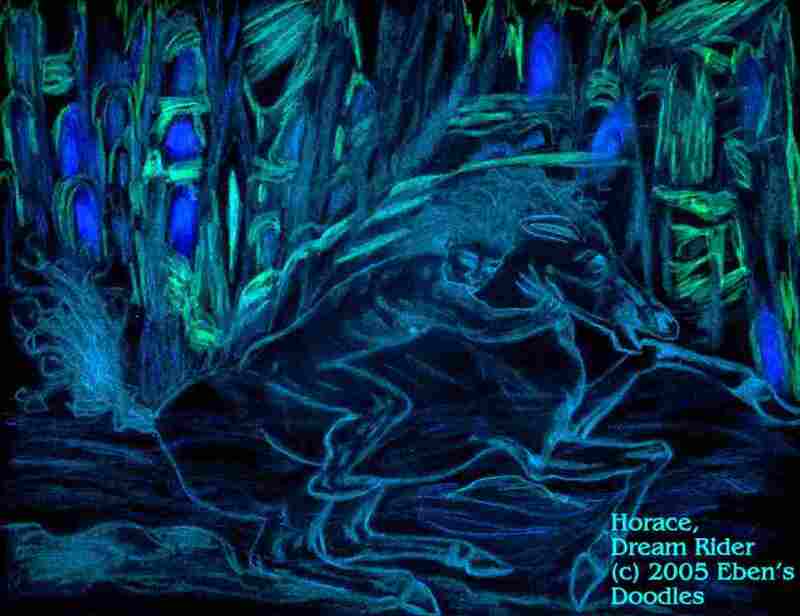 As his spirit-journeying forefathers commonly experienced dreams and visions while awake, so Horace was given the vision of his life. 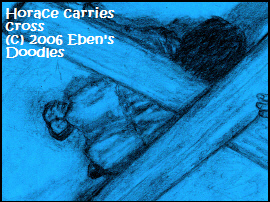 He saw himself suddenly transported skywards, while he clung for dear life to the very thing he was carrying on his back. He hardly knew what he was doing, as the vision took him far above the earth. It lasted only a few seconds or five or ten steps down the street, but as the crowd in the amphitheatre watched him, they could not have guessed what he was experiencing and discovering in those brief moments. It was a great Dream, the greatest Dream, he realized, that ever was dreamed. In fact, no mere man or mortal being could have dreamed it. This whole drama of the Passion of Christ, which to him had meant little more than a way to pick up some handy money, was everything the sisters and the priest at Holy Cross had tried to impart to him as a boy--actually, it was more, far more! Whose Dream was it? Who was the Greatest Dreamer? And why was it dreamed? As he walked out of Spearfish and the Black Hills the next day, no longer needed to stand-in, he had some things to think about as he headed toward the Southwest. 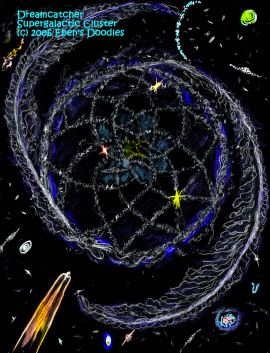 Not only was he taken above the earth--but the next thing he saw was a gigantic dreamcatcher, only it was composed of clustered galaxies, in numbers he could not possibly calculate or grasp with his mind, even though he was seeing them. What was it he had heard from Someone "up there"? It was clear enough: "I will make you my Spearer of fish! 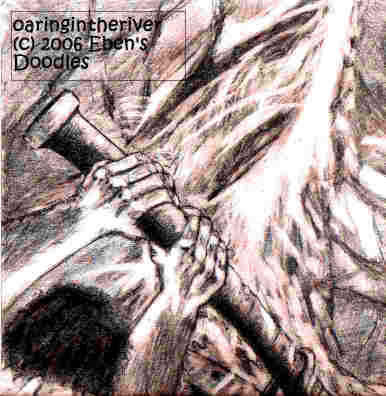 You will spear many fish, many people, for Me!" 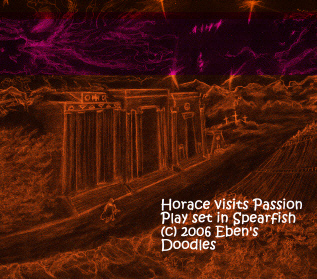 That was enough for Horace! Like old Jonah the prophet of Israel, he took off in the opposite direction, where he was least likely to run into any people. Way back in time before the Cyber-ARGO, there is Jason, captain of the original Argo and the expedition. 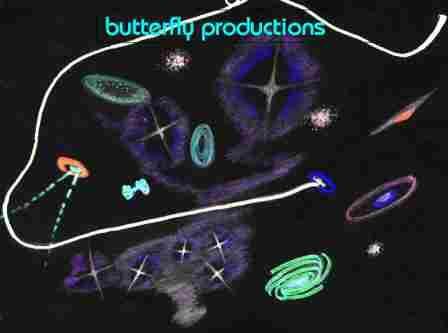 Though it wasn't apparent at the time, this too was woven into the Dream that Horace rode many years into Jason's far future world (for Jason changed the world single-handedly, even though he had fifty champions to help him do it). 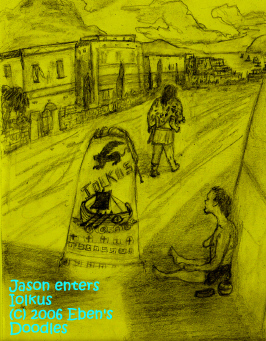 Jason suddenly appears one day in Iolkos in Hellas, wearing a jaguar-skin and only one sandal. After a brief greeting to a beggar in the street, Jason leaves a sandal on the top of the carved stone at the city's edge bearing the city's name. The one-armed beggar stares long and hard at it. Does the sandal's owner mean that the city and kingdom are now under his authority, and he intends to go and overthrow the king and put on his royal golden sandals? Or does leaving a sandal on the city's name-stone mean he has marked his escape route and he intends to return that way, should his venture fail? Or does it mean he has wagered one part of his plan, and has another better part in reserve? The beggar scratches his head. It is hard to tell just how the wind blows with this strange, lion-maned youth. The beggar will have to give it some more time and thought, but, fortunately, he has plenty time to do that--and perhaps some news will be coming about the stranger--and he, being so well situated, will surely be one of the first to hear of it from passers-by. Jason, the son of the previous king (who was injured permanently in a hunting accident and let the throne go under his brother's aegis until his son came of age), is now of age to rule as the heir to the kingdom of which Iolkos, a small Aegean port, is the capital. Although he cannot find much excitement in the idea, he has come to claim his throne, so he goes first to the royal palace and fortress on the hill where his uncle, Peleus, is reigning in his stead. 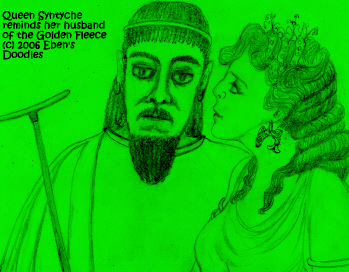 The "interim" king agrees to the legitimacy of Jason's claim, but taking the whispered suggestion of his wife, "Queen" Syntyche, he has second thoughts about turning the throne over immediately. 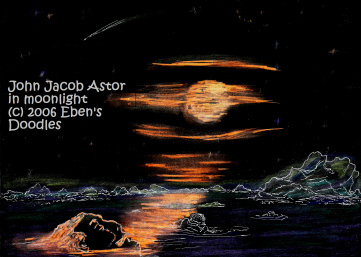 Seeing he has a high-spirited champion on his hands who can easily take whatever he wants when he wants it, Peleus offers Jason a challenge of his strength before he turns the throne over to him--a quest over the wide sea for the Golden Fleece. Jason, not so anxious to settle down to the rather humdrum duties of a petty kingship, eagerly accepts the wily Peleus's diversionary tactic as a true test of his own strength and daring. 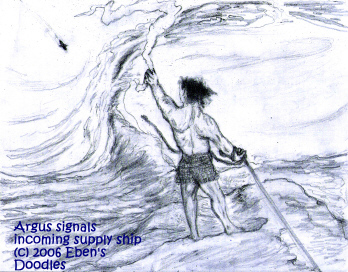 Argus the master ship-builder of Thessaly hears of the coming voyage and offers the finest ship in the world to Captain Jason--which he will design and build especially for this voyage. 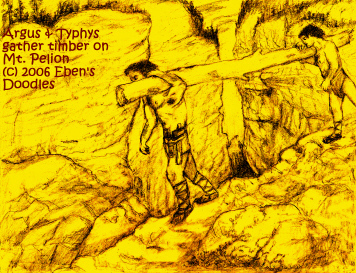 He already has a prime piece of wood, oak from Dodona, hewn from the very tree that was reputed to tell the future. Whether or not his oak beam will tell the future is yet to be seen--but he intends for it to go into the ship in some good spot that will give honor to it. The ship will win him undying fame, but when a youth of means offers to buy the vessel so that he could be the captain, he might have let him have it, except that he wasn't going to sea under such a fool of a captain as this youth would make. That would put two fools to sea, and they'd both drown! A champion from Thebes, a leading city-state, comes in his own ship and goes to find Jason to tell him he has decided to lead the quest for the Golden Fleece. Jason will soon send him packing, after a few words with him. What happened? 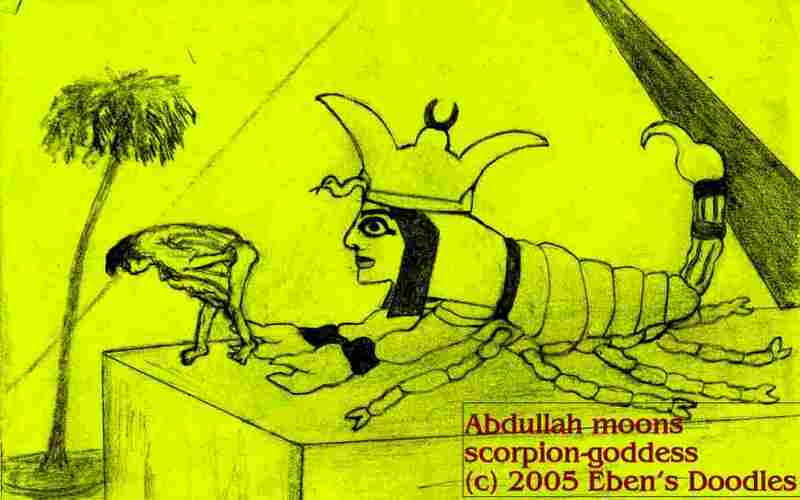 Jason's sharp eye catches the Theban's reaction to a long, many-legged insect that crawled out of the wood shavings at his feet, and the champion, when Jason presents him with an additional spider on a stick, is terrified. If that wasn't enough to disqualify him, Jason gets him to admit he can't swim-- since being a prince of Thebes kept him from the normal pasttimes of boys and all he ever had was baths in the marble pool of his father's palace. 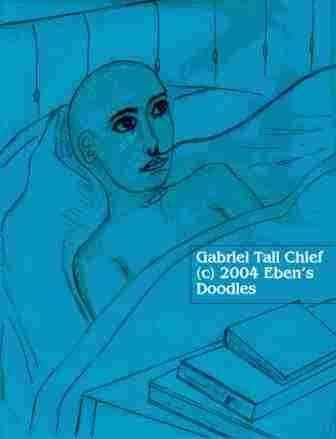 Rejected, the prince of Thebes departed in a huff, declaring Jason's ship was not worthy of a noble Theban on-board! 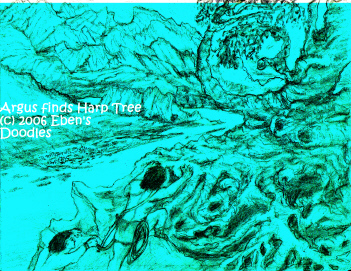 While looking for suitable trees for the mast, Argus comes upon a harp-shaped Acacia tree. 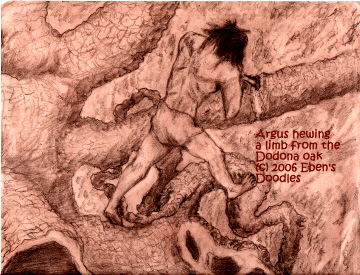 Argus, hunting trees one day, spots a supply ship coming in, carrying the needed things he has ordered from Athenos in order to finish the Argo. Having done business before with the Athenians, they trust Argus and send anything he wants--by special delivery. 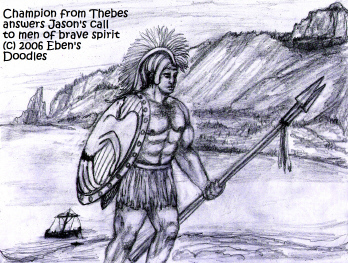 As the Argo nears completion, Jason sends out a call to all of Achaea, for brave men to join him in the quest of the Golden Fleece. 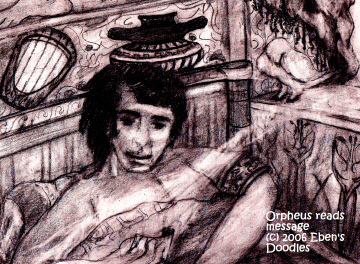 Orpheus, the greatest musician of Achaea, is recovering in bed from the attacks of fanatic women followers of the wine god when a dove brings him Jason's message. Waking, he finds the exhausted bird already asleep, and takes the tiny scroll tied to its leg to read. 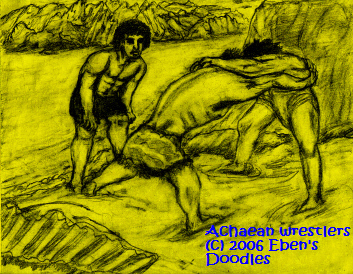 It takes some time, naturally, to get a crew of fifty selected and equipped for a long sea voyage, so there was opportunity for recreation such as wrestling, the Achaeans' favorite sport next to fighting with arrow, sword, javelin, dagger, and whatever else could serve as a deadly weapon. They can be forgiven by our more civilized culture--as this was back when men were men, and pansies were still nothing but wild flowers. As for rules, the Achaeans thought the fewer rules were the better rules. Kicking, biting, pulling hair, punching private parts, spitting, head butting, you get the idea--it was all fair play to the Achaeans. They knew how to make the sport interesting and fun for all. The sons of these champions would sail their ships to Troy, and you should know what happened to Troy--yet the next generation was a bunch of sissies compared to Jason's Argonauts.